The watch has worked well, with one critical and debilitating flaw that has turned it into a piece of jewelry. In technical gear Nike has exhibited the “all show, no go” syndrome (for example, the Nike Running cloud software looks fantastic but has limited useful functionality when it comes to reporting) and this watch has ultimately suffered from this. 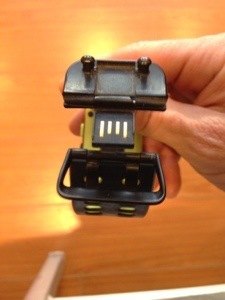 The watch relies on what appeared to be a very clever USB connection hidden in the strap buckle (see photos). This is the only way to recharge the device, and to upload runs, clear memory, update watch firmware and settings via the Nike Connect software on PC and Mac. Unfortunately the wires between the USB plug and the watch itself are not robust and partially failed (of course about 3 months after the one year warranty) and despite numerous calls to the nice folks at Nike Support and multiple attempts the watch is no longer recognized as connected by the Nike Connect software. It can still be recharged however. Doesn’t sound too bad right? Can still use it to record runs and manually record the distance and time, right? Well yes, until the memory fills up and one discovers there is no way to delete what is in memory, either through a simple erase capability on the watch (best) a device reset (ok), or running down the power (painful, but doable), and the watch will not record new runs once the memory is full. Final injustice? Watch is not repairable or serviceable in any way. My plea to product designers: think about failure conditions and how your device will work (or not) once those occur and always provide a workaround! Even if that means just making it repairable. Ever owned a piece of technology with the same flaw? I’d love to hear your stories. Got the exact same problem with my Nike+ SportWatch. I did’nt notice the crack in the wristband until i saw your pictures. Now i know what to say when i’ll send it back to the store (still got 1 month warranty left). Sorry to hear it, hope this helps! My replacement is doing fine. Same happenned to me, after 1 year and 5 months with the watch started taking longer to be recognized by the PC when plugged in, it required more USB insertions until one day it just stopped being recognized, I can’t even charge it anymore. I contacted Nike a few times, spoke to a few people, looked around in forums, bah! in summary they told me that after one year this device is considered “disposible”, a watch that costs more than 200€ watch is considered “disposable” after 1 year. Pathetic! I still can’t believe it, they spend millions sponsoring a few folks around the planet and can’t even develop a proper watch. So sorry to hear this happened to you. In a last ditch effort I tried Nike Customer Support again and got lucky with an agent that actually was able to find an exchange program for watches built before they fixed this flaw. Might be worth a shot if your watch was made in first 12 or so months of production. Rich, thank you for your tip, it really helped me. I had the same issue with my Sport Watch and I just got my damaged watch replaced by a new one. Mine was almost 4 years old and I wasn’t asked even for any proof of purchase. I have to recognize that even if the design was not the best one, Nike’s customer service was very helpful and efficient. No complaints at all! Jesus, so glad that worked out for you! Hi, I seem to have encountered the same problem. Has anyone had any luck exchanging the watch for a new one? Brett, absolutely. If you have one of the early gen versions (first 12 months or so) they were replacing it. Try customer service and see what happens. I think same thing happened to my watch today. My computer stopped recognizing it though it still charges. Now the lens is fogging up, which has never happened before, so I suspect the problem is moisture that is getting in now whereas it wasn’t before. Luckily, nike customer service was friendly about sending me a replacement. My question is, were you told by customer service that it is a design flaw that has been fixed? I’m curious because the rep I spoke to was kind of coy about it, like he had heard the problem I was describing many times before but didn’t want to let on that that was the case. He said I was still covered under warranty even though it technically expired about 8 months ago. After reading this thread, I’m starting to think they gave me grace on the warranty because I might have had what you are referring to as an “early gen” version. However, I wasn’t aware that there were different generations of this watch. By “early gen” do you perhaps mean versions of the watch before they quietly fixed the flaw? I’m just looking for any peace of mind that my replacement won’t just break the same way. Hi Pat, so glad they helped you out! Yes, they told me it was a design flaw in the watches they made over the first 12 months and that later watches has a strengthened/improved band where the connection was less likely to break. I don’t believe they changed the model numbers, just later batches didn’t have the same issue. That’s what they told me anyway! Thanks for sharing. I had the same issue last week. I spoke to Nike custumer service. They troubleshooted the watch and even plugged the watch directly into the usd port. But the software still did not recognize the watch. It turned out it was the watch itself that is defective. The watch looks new and there are no cracks or tear. The next step is more troubleshooting and they said if they can’t fix the issue they will send me a new watch. I put my finger under the usb symbol of the connecting cable on the watch end and pushed the watch band the opposite direction. I kept this until all the data was loaded. the software recognized the watch and uploaded the watch data. I tried this trick few times until it worked. Now I can use the watch again until next time. But I am hoping Nike will replace the watch. Hi, finaly i have found the answer to my problem. I’ve experienced this problem some time before the waranty was ended. I thought though that the problem was in my computer. I have spent quite some time to try to solve it by plenty of different actions on the computer. Of course, without no success at all. I have called the Nike Support and have described the issue to them. They gave me the same advises as you can find in the f.a.q. on thier web site. I also googled the topic several times until now when I found your blog. I have exactly the same problem as you have. The memory of the watch is full and can’t be erased. It can still be charged but it can only be used for time and as a stop watch. Tomorrow I will give Nike a call and hope that they are taking their responsability for the weaknesses in the design that the product has and that they will replace it. I bought my watch in September 2011 so it’s much likely one the early one. Let’s see what they have to say to me tomorrow. I encourage everyone with similar prolem to write about it and also to contact Nike. The will probably increase our chanses to get help. Good news! I spoke to Nike today. They will replace my watch. I’ve had the same problem – would not connect a few weeks after the warranty expired. Nike refuse to replace it though. I’ll never make the mistake of buying a Nike product again. That’s odd. My warranty is expired by 8 months and they still agreed to exchange it under the warranty. Maybe try again and hope you get a nicer rep? Hi Pat, I should give that a go. Had the exactly same problem, and Nike is refusing to exchange it. Got a nice piece of technologic jewelry junk as well, apparently for good! I know this thread is old, but Nike just replaced my broken Sportswatch. My family initially purchased the watch in May 2011; after consistent use, it stopped syncing in Jan 2014, because of the “micro” cracks. I called Nike support and they verified my logged activity, and requested I send my defective watch to them. After inspecting the defect micro cracks, they shipped me out a new sportswatch (only color available was white). Mark, that’s awesome news. It seems like if you find the right person they’ll look after you. Hi Mathurin, I’d say if it’s failed take it in and see what they say. Nike will be able to tell from the serial number. I recently had an issue with my watch of 5 years, and to my astonished and surprise it was replaced free of charge. Now I think I know why – thanks so much ! Hi all! Looking for similar stories to mine I found this blog… You gave me some hope. 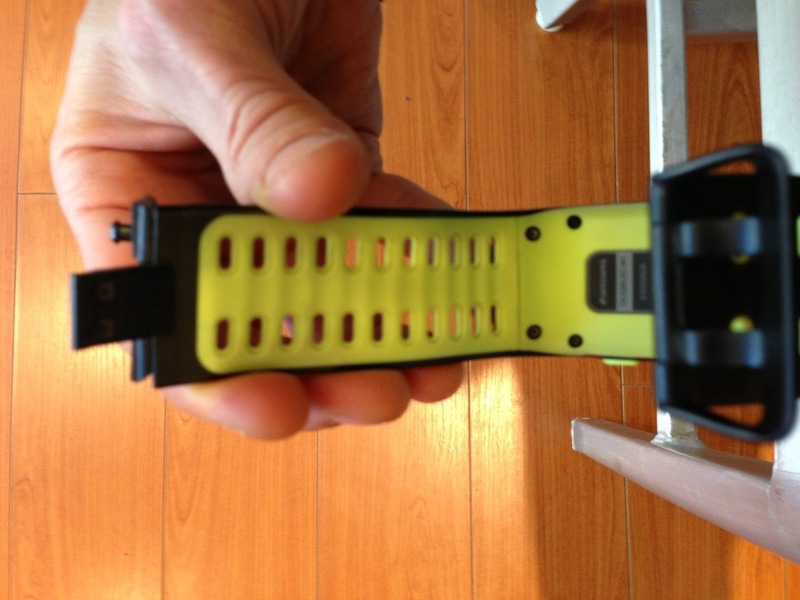 My FIRST nike sport watch was gave me as a present in July 2012, usb not recognized after 1 year, and now again!!! But the first time warranty was still valid, this time is not. And they wrote me “warranty expired, no way”… but after reading your stories I’ll try again… so many watches had the same problem!! Hi Anna, if there’s one thing that all the experience on this post points to, it’s that trying again often yields a different result. My fingers are crossed for you! 😦 I’ve asked to the shop and they also used to change the watch out of warranty… until they used to sell them, that was some YEARS ago..
🙂 I’ve found a great offer on a tomtom runner watch! 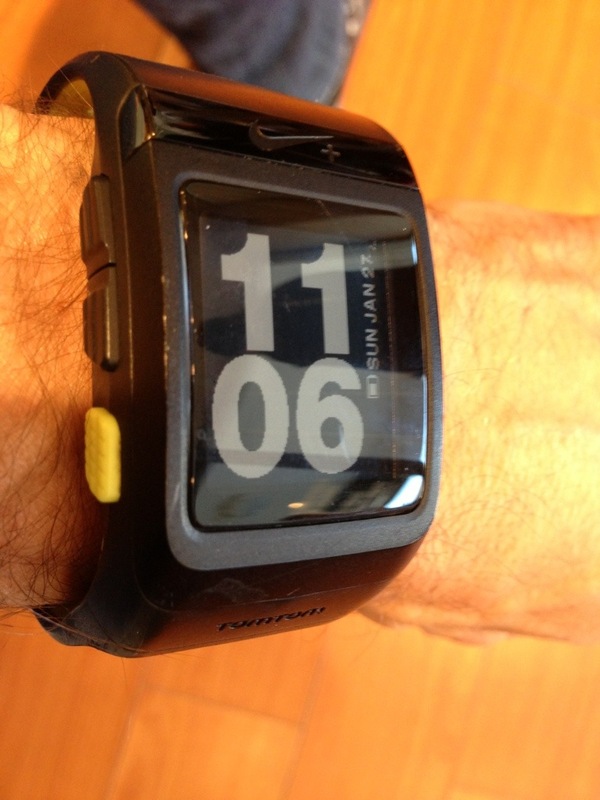 (and I can upload workouts on nike+) I’ll try the new watch this week! Thanks for a great article Rich. I had a similar issue with my watch. It was just over a year and a few months old until the band snapped. It snapped on the side where the buckle is connected so away from any USB connection. The electronics work fine although sadly I am unable to strap it to my hand. I’d be curious to know if there are secondary bands I can add to the watch to return it to its former functionality? Love to hear your thoughts here. Hi Joseph, thanks so much, I wish I knew the answer! I am thinking the design is quite specific so it may be really hard to find a generic 1/2 strap that works. Perhaps head to a watch repair shop with a good range of bands and see what they can do? 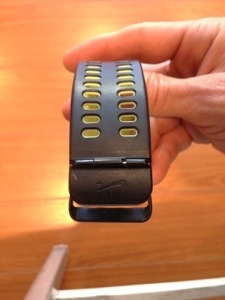 Have you tried Nike customer service to see if they will replace the band? Hi Moriah, wish I could tell you I was a guru on this, but I’m just a guy who wrote a post telling about my experiences. Based on all the comments it seems like for a while you could try different Nike Customer Service Reps until you could get one that would help, and lately that seems like it hasn’t been working out so well. Sorry not to be more helpful, I wore mine until it fell apart and then accepted it was time to move on. I received my watch in December, 2013 and it lasted until today, when the memory became “full.” Looks like the band broke at the same time. I realize no one has posted here for a while, but I thought I’d contribute my experience. AMazing it lasted this long! !